Frank Williams embarked on a career in real estate with a desire to change the industry – and there is no doubt that in his longtime REALTOR® service, he has done just that. Frank entered the industry in 1971, following the civil rights movement. He quickly caused a stir. “I looked at people like Sheldon Good and Arthur Rubloff, and I said, ‘I want to climb that mountain and get that high in the industry,’” he said. Frank’s mission was to ensure the American dream of homeownership was attainable to everyone, regardless of the color of their skin, and he has spent the majority of his career fighting tirelessly to make housing accessible for all. Upon opening his own brokerage, F.J. Williams Realty, in his Beverly neighborhood, he was accused of being a blockbuster. The community did not take kindly to Frank assisting buyers in the neighborhood; they protested regularly outside of his office. He was subjected to vandalism, like broken windows, and a bomb was detonated on his front porch. The justice department opened an investigation into his business affairs with the explicit desire to tie up his business so he was unable to practice real estate for a period of time until the inquiry was resolved. Frank’s fight for equality led to his longtime involvement in the Southside Chicago branch of the NAACP. He also turned his attention to the future of real estate, and the importance of broker education for all aspiring REALTORS®. Starting in 1974, Frank began teaching at the REALTORS® Real Estate School, where to this day he influences brokers of all ages and ethnicities who are embarking on their own careers in the industry. 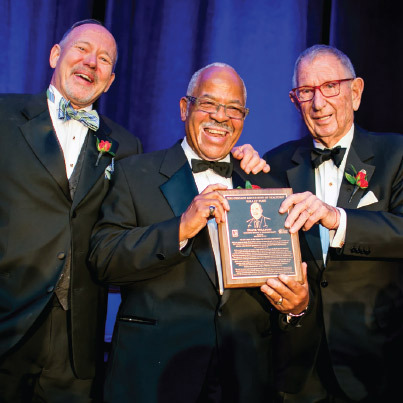 Frank’s service and passionate advocacy led to his volunteer leadership involvement with the Chicago Association of REALTORS®. In 1989, he served as president. He has also served as president of the Dearborn REALTIST® Board and as a board member of Ada S. McKinley Community Services, among many other accomplishments. 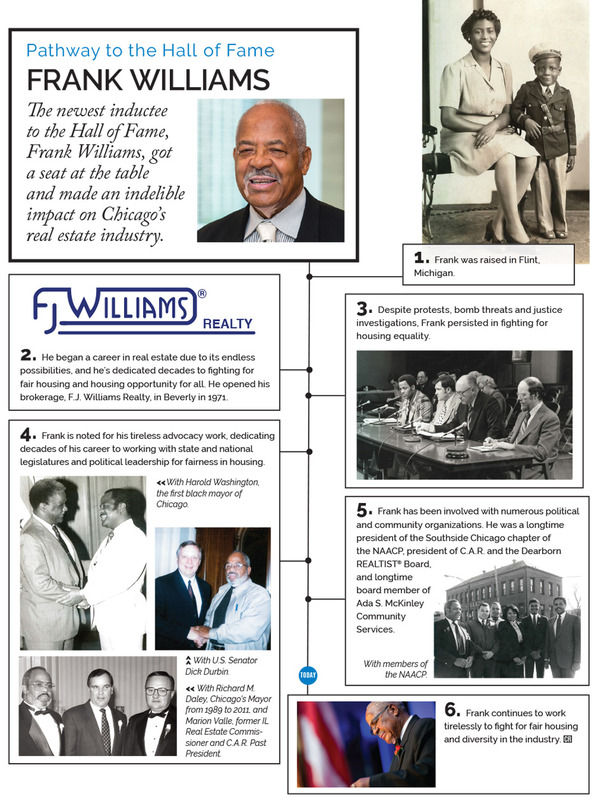 To this day, Frank continues to be a strong advocate for fair housing in Chicago, and an important mentor for brokers beginning and growing their real estate careers. Truly, he got a seat at the table, and he made a difference. Congratulations, Frank, on your well-deserved induction into the Hall of Fame.